Against the backdrop of a severe recession and talk of EU and IMF involvement in a bail-out deal for Ireland, three left-wing parties - the Socialist Party, the People Before Profit Alliance and the Workers and Unemployed Action Group - announced that they would contest the next general election under the single banner of the United Left Alliance. Though this alliance did not formally appear on the ballot papers, it won 5 seats in the 31st Dáil after the 2011 general election. 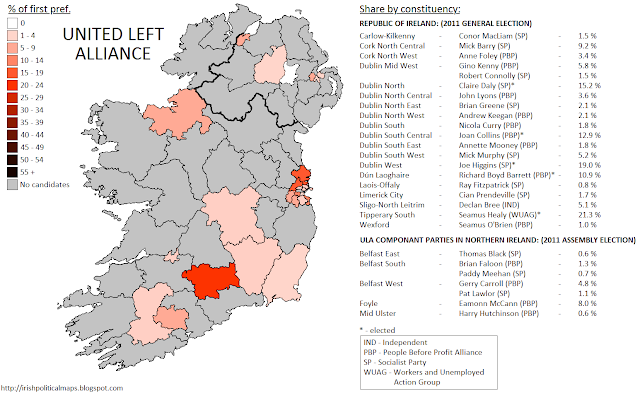 Of these seats, 2 were Socialist Party candidates, 2 were People Before Profit candidates, and one was incumbent South Tipperary TD Seamus Healy,the founder of WUAG. The group's presence in the Dáil was a sign of the big shift that occurred in Irish politics after the election. Between the 5 ULA TDs and the 14 Sinn Féin TDs, there was now a considerable left-wing opposition in the Dáil, one which was further left than the more centre-inclined Labour Party - now in government - had been. The 5 TDs form part of a technical group with other Independent TDs. 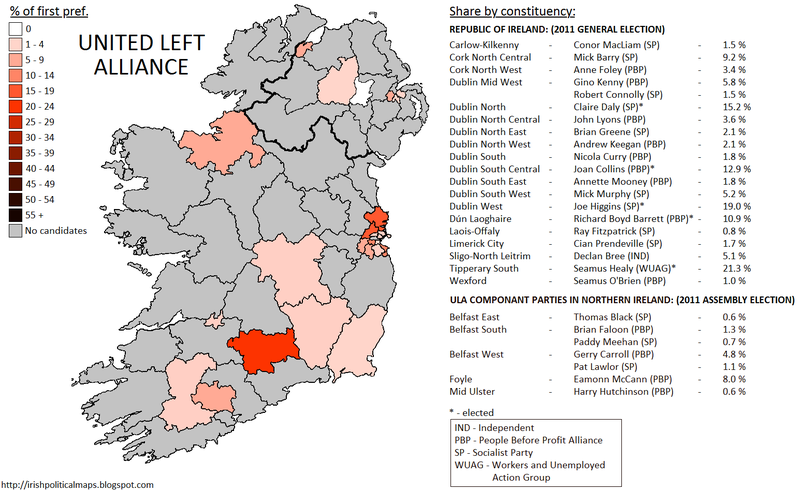 Though the United Left Alliance does not exist as an entity in Northern Ireland, two of its componant parties - the Socialist Party and the PBPA - ran in the 2011 Assembly elections. As such, their performance is included in this map. Click on the map to see it full-sized.